It took me a while to realise that when Stephanie Krieger said her new book was on the way, it was not necessarily going to be published under a similar title to her previous one “Advanced Office Documents 2007 edition”, in the MS Press “Inside Out” series. So I’ve only just got round to finally ordering Documents, Presentations, and Workbooks: Using Microsoft Office to Create Content that gets Noticed which is the updated version. Not the snappiest of titles, and if it is anything like her last it should have really been called something like “How to make Office 2010 really rock”. I’m hoping it will be as brilliant and have the same deep content as the previous one, which certainly taught me loads about the packaging and XML structure of the new document formats, as well as some great stuff about using content controls in Word. If I get time I’ll do a proper review when I’ve worked my way through it. Last month I wrote about the planned availability of Service Pack 1 for Office 2010 and SharePoint 2010 for the end of June. And it’s here! You can now download the whole service pack file as a self-extracting executable and simply run it to install, or you can use Windows Update, where it is listed as an Important/High Priority update (rather than critical or security) for you to manually install (after 90 days this will change to an automatic update if your system is configured for that). At the moment my 32 bit install claims this would take 409 MB via Windows Update compared with only 361 MB for the full exe package download. Even if you only have 1 machine to do, you will save marginally on the file size if you manually download Office 2010 sp1, and then of course you will have the file to use again on any other machines that need it – if like me you are the de facto IT support for family and friends, this can be quite useful. A few key changes relating to other products are that Outlook 2010 sp1 will fully support the now-released Office 365 online business applications suite, while SharePoint 2010 will support SQL 2011 and has improved support for users of Internet Explorer 9. So, there’s lots of information about this important update, as well as the downloads themselves, so let’s dive straight in with a load of links to the things you probably want to get hold of straight away. The Office Sustained Engineering blog has an announcement that Service Pack 1 for Office 2010 and SharePoint 2010 is on track for release at the end of June. As you might expect, this will include a roll up all previous patches and cumulative updates, as well some minor feature changes. Update 28th June 2011: It’s here! One of the changes declared for Service Pack 1 will be to revert the behaviour of the reminders window in Outlook 2010 back to the way it worked in 2007 thanks to sustained pressure from various contributors on the Microsoft Answers forums. In Outlook 2007 when you snooze a reminder it remembers how long you snoozed that item for, and next time it comes up that is the default time chosen so you can very easily hit snooze again for the same delay. Each item (calendar entry, task or follow up) remembers it’s own interval so you can snooze a meeting later today maybe 15 minutes at a time, but a reminder about a conference next month a whole day at a time. Outlook 2010 changed this behaviour so that each time you snooze any item, the time interval chosen is remembered for the next item as well, which means some people found they had to keep changing this back and forth between different values, and might snooze something for too long without realising – possibly ending up being late for that important meeting for example. Service Pack 1 will switch this behaviour back to the 2007 method, and it sounds like this will just happen, rather than providing the user with any option to choose which approach works better for them. Which way would you prefer this to work? Let us know via the comments. For over a year now people using Outlook 2010 have been able to add public holidays for their country, with the slight problem that many of these holidays have several errors in at least 23 countries around the world . I have actually seen some people report the problem and offer fixes for it which still contain some of the incorrect dates, or “corrections” which introduce different faults. Hopefully Microsoft will stick to their plan of including fixes in the service pack to finally address this problem, but there is no detail available on this yet, but we’ll update this with any news when it arrives. Businesses have been able to get their hands on Office 2010 through various licensing options such as Software Assurance for just over a month now, and system administrators may have begun testing, rolling out and managing their new Office 2010 estate. Now the rest of the world can catch up as Office 2010 becomes available through all sorts of channels to purchase as boxed products through high street stores and online retailers, as well as options to download if you really can’t wait for the postman. Eric Ligman has a great page about Office 2010 with lots of links to more information, documents, videos and the Office team blog. Really useful stuff all put together in one place for you to help you find out about the new features in Office 2010, decide if you should upgrade, and choose the right version for your needs. Working with major retail partners and PC makers, we’ve made dramatic changes in the way we deliver Office 2010 to give consumers more buying choice, making it easier than ever to unlock the power of Office on new and existing PCs. For the first time, people can purchase a Product Key Card at retail to activate Office 2010 preloaded on new PCs. For those who want to download Office 2010 direct from Office.com for an existing PC, the new Click-to-Run technology will have them up and running in a matter of minutes. One of the issues with any software upgrade is that as well as finding all the new features and getting to grips with them, there is also a certain amount of reorganisation, renaming and generally moving around of menus and toolbars to seemingly more logical places. Never was this more apparent than the complete replacement of the old Office menus and toolbars with the Fluent User Interface and the Ribbon in Office 2007. The new style Ribbon is still retained in Office 2010, and you can now customise this to suit your own use. 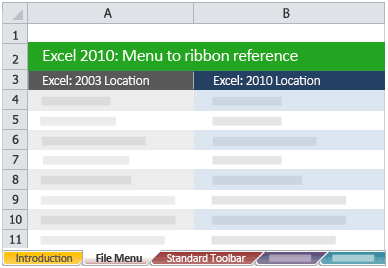 To help people who are upgrading from Office 2003 (or those who upgraded to 2007 but still have not got to grips with where everything is) Microsoft have published a bunch of reference documents to help you find Office 2010 features in the Ribbon. These are all presented as Excel templates, so if you don’t already have Excel 2007 or 2010 installed, you will need to use the Excel 2007 viewer discussed here. Simply download the files you want for the programs you use, save them somewhere on your computer, then double click to open them whenever you find you have lost a function you used to use a lot. Given that most features that were kept in the product from earlier versions through to 2003 did not move around much, you will probably find these references equally useful if you are upgrading from 97 or 2000, say (I suspect if you are just getting round to upgrading from Excel 5 or earlier you might have other things to worry about!). Have you upgraded to Office 2010 already? Do you have Office 2007? How have you found the transition from menus and toolbars to the Ribbon way of doing things? Office 2010 has now been released, so inevitably some early adopters (like me) will be deploying this in their businesses. If they are your suppliers, customers, partners or just other folks you know, they might want to share their files with you. So how can you read these documents if you don’t have this latest greatest version yet? There are various free options available to you to view them, depending on which version (if any) of Office you have. Looks like Microsoft are too popular for once, and shot themselves in the foot. The Office 2010 launch which was supposed to be taking place today in 38 countries (or was it 60?) at 15:00 UCT is currently falling very flat as it struggles with the load of too many people trying to see what all the fuss is about. I am sure Stephen Elop is giving a rousing speech to the several hundred people who have gathered in New York to hear him live, but the “virtual launch” is a big fail at the moment. The links to the live keynote speech media stream are not connecting, the main launch website returns a 503 or a custom “service not available” message. As an aside, the launch site is running on Sharepoint 2010 – maybe that dog food does not taste so great today. So far a great product looks like it is being let down by a launch which is going to be an unfortunate flop.